Known as ‘The Petrarch Master’, the German artist Hans Weiditz the Younger (1495-c.1537) was friends with an elite group of woodcut artists including Albrecht Dürer, Hans Holbein, and Hans Burgkmair, who was his teacher. This is his ‘Cheesemaker and wife’, one of the many colourful leaflets he produced dealing with common folk and working life. 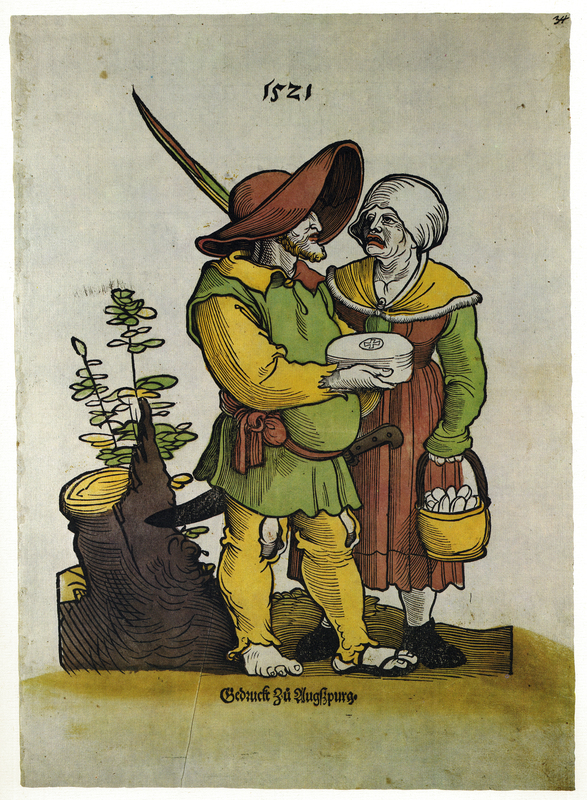 Hans Weiditz, “‘Käsebauer und Käsefrau’ [Cheesemaker and his wife] (Augsburg, 1521) from Flugblatter der Reformation und des Bauernfrieges,” ourheritage.ac.nz | OUR Heritage, accessed April 26, 2019, http://ourheritage.ac.nz/items/show/10391.